Networking can seem very complicated and overwhelming, especially if you’re not a network admin. We understand that and are here to help you get more comfortable with all things networking. We’ll talk about the equipment used, the types of networks, and the different topologies used to design networks. There are 6 main types of networking equipment that you need to be familiar with. Let’s dive right in. A switch is a network device that connects devices together on a network by using packet switching to receive, process, and forward data to the destination device. These send and receive data to devices they’re connected to. They do not route the data unless the switch has Layer 3 functionality. Switches can be either managed or unmanaged. Unmanaged switches have fixed configurations and features, where managed switches give more control over traffic and access to more features. A router is a network device that forwards data packets between computer networks. Routers perform the traffic directing functions for the network and tell the data where it needs to go and how to get it there. An access point is a network device that allows a Wi-Fi device to connect to a wired network. Wireless Access Points (WAP) and Access Points (AP) can be used as a bridge for networks to distribute connections, as well as power over ethernet (PoE). If you need your Wi-Fi signal to get to more areas than the router reaches you can use an access point to extend the signal’s reach. A Wireless LAN (WLAN) Controller is used to manage, configure, and secure wireless access points in large quantities. The WLAN can be either a physical appliance or software, typically through cloud integration. A gateway is a network router or node equipped for interfacing with another network that uses different protocols. Gateways can be either software or hardware devices. They act as “gates” between networks with both router and firewall functionality to enable and route traffic flow. A system designed to prevent unauthorized access to or from a network. Firewalls are hardware, software, or a combination of both. Firewalls define the criteria by which data packets can be safely routed through a given network, also known as the security of the network. Now that you’ve gotten familiar with the type of networking equipment let’s talk about the different types of networks. There are a lot of different type of networks so in order to build the correct network you need to know what type fits your environment best. 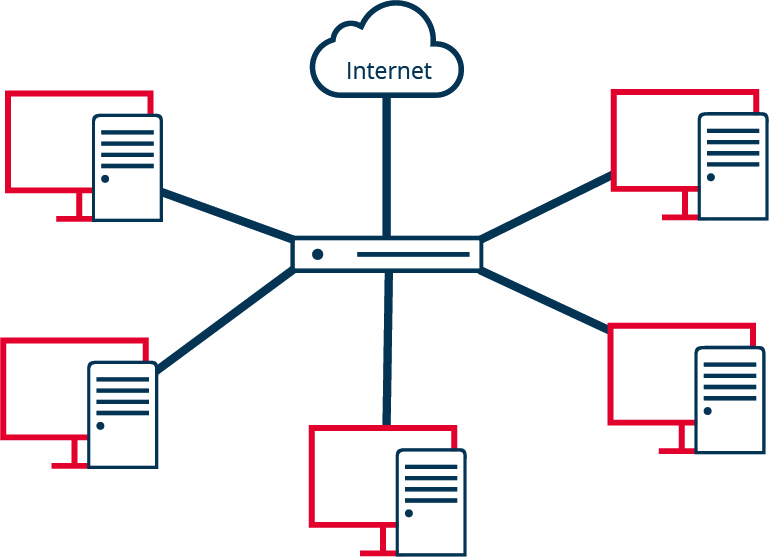 A VPN extends a private network across a public network and enables users to send and receive data across shared or public networks as if their computing devices were directly connected to the private network. A network designed for high-speed interconnection in cluster environments (server to server), multiprocessing systems (processor to processor), and SANs (storage area networks). A point-to-multipoint LAN architecture, POLAN uses optical splitters to split an optical signal from one strand of single mode optical fiber into multiple signals to serve users and devices. A topology is the geometric arrangement of a computer system. This is how the computers connect to each other. There are 5 main topologies that you’ll want to know about and consider for your network. In the Star Topology, all of the computers are connected to a central point. Each computer has a single connection to that central point. If the central point goes down the computer loses connection and has no other way to connect to the network. The main concern with a star topology is that if the central point goes down, then all of the computers connected to it goes down as well. This type of topology is best suited for small networks with a limited number of computers. In the Bus Topology, there is a single connection that all computers attach to in a line and Ethernet systems are used. If a computer loses connection there is no other way for it to connect to the network. Also, if the there is an issue with the main cable, then the whole network is impacted. 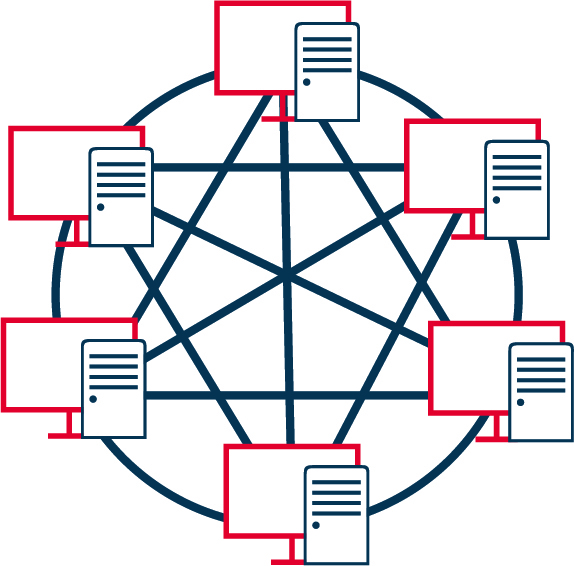 A major consideration of the bus topology is the number of computers connected to the network. The more computers added to the connection, the slower network performance will become. Smaller networks are ideal for the bus topology. 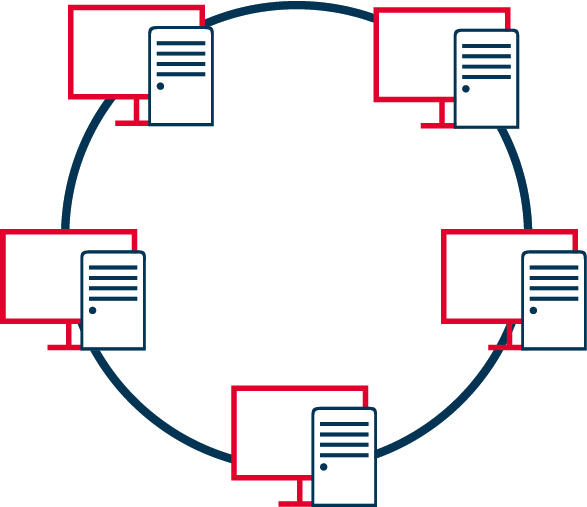 In a Ring Topology, all computers are connected together in a circle (aka ring). Data moves from computer to computer until it reaches its final destination. Often times, the data moves in one direction only. A big consideration for ring topologies is that if one connection goes down the ring is broken and the whole network is impacted. This type of topology can be used in LAN and WAN networks. 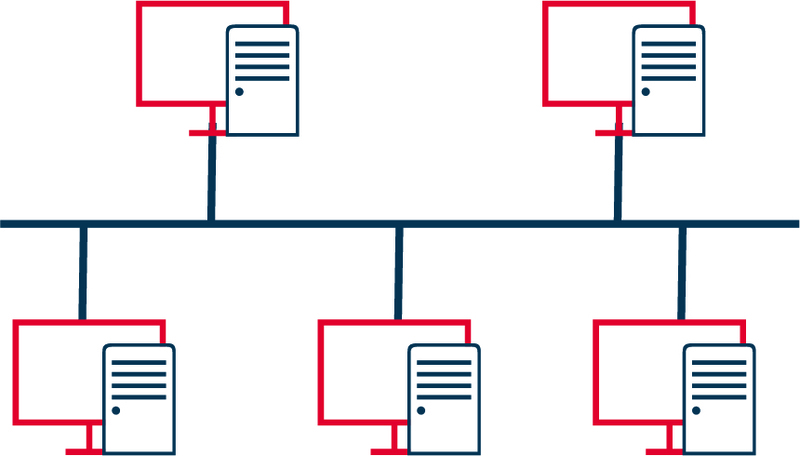 In a Mesh Topology, every computer is connected to every other computer with multiple connections. That way if one connection goes down there are always other connections to rely on. This is a highly redundant topology which means it can also have a higher cost to implement and set up. This type of topology is often used for wireless networks. It can also handle larger networks better due to having many devices transmitting data simultaneously. The Tree Topology is a hybrid network topology in which star networks are interconnected via bus networks. This can also be referred to as the Star Bus Topology. In a tree topology, if the main cable between each of the two star topology networks fail, those networks would be unable to communicate with each other. However, computers on the same star topology would still be able to communicate between themselves. This is often used for larger corporate networks. We understand that deciding how to best build your network can be intimidating but it doesn’t have to be. Aventis Systems has a team of experts that are readily available to help you find the exact networking equipment you need. They can also help you design and implement your network. If you would like to talk with someone about your networking needs than contact us here. Aventis Systems also carries a full range of networking solutions from the top brands. Choose from Cisco, Meraki, Dell, HP, and Juniper networking product. You can also contact us to get a custom quote and we will help you find everything you need to fit your environment.